PT Permodalan Nasional Madani (Persero) - PT PNM (Persero) or referred to as "PNM" is a well-established state-owned financial services company in Indonesia with rapid business expansion. PNM has strong business focus on business development of Micro and Small Enterprises with core business competencies in providing financing and assistance of SME business. Its business include financing services, management services and the capacity building program, and venture capital financing services. PT Permodalan Nasional Madani (Persero) was formed in 1999 by the Government of Indonesia under the Government Regulation No 38 of 1999 dated 29 May 1999. PNM is based in Jakarta and offer services through more than 73 ULaMM branches, 372 Mekaar Branch Offices and 666 outlets of Micro Capital Service Unit spread across Indonesia (as of December 2016). PNM also supported by 5 subsidiary companies (including shares in 3 BPRS), 8 sub-subsidiary companies, and 5 affiliate companies. According to PT Permodalan Nasional Madani (Persero) Annual Report 2016 as cited by JobsCDC.com, PNM’s financial performance in 2016 improved over the previous year. PNM reported total asset of Rp 7,755.62 billion in 2016. Thus total asset number is up 29.12% year-on-year (YOY) from Rp 6,006.10 billion in 2015. Total revenue in 2016 amounted to Rp 1,291.80 billion as compared with Rp 1,182.46 billion in 2015. Total net profit in 2016 reached Rp77.02 billion, increasing 17.50% YOY compared to Rp65.60 billion in 2015. Minimum 1 year of experience as Sales/Marketing (preferably in micro finance institutions). High integrity, target oriented, strong analytical and able to maintains financing. Have customer base will be an advantage. Have own motor vehicle and SIM C.
Placement in ULaMM PNM area : Solo, Boyolali, Karanganyar, Sragen, Klaten, Sukoharjo, Wonogiri, Madiun, Ngawi, Ponorogo, Magetan, Pacitan. JobsCDC.com now available on android device. Download now on Google Play here. Please be aware of recruitment fraud. The entire stage of this selection process is free of charge. 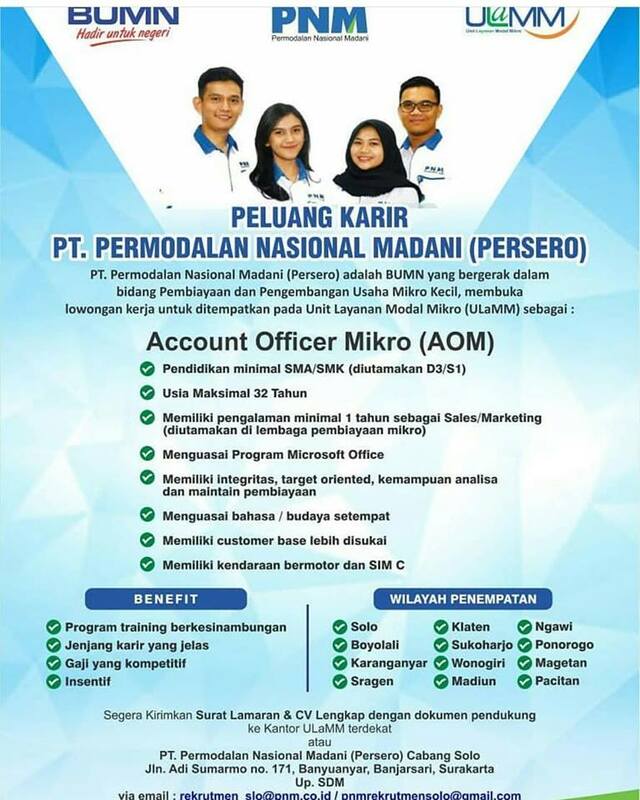 PT Permodalan Nasional Madani (Persero) - Micro Account Officer ULaMM PNM April 2018 will never ask for fees or upfront payments for any purposes during the recruitment process such as transportation and accommodation.